Ric Addy is a throwback retail hustler, riding the shock wave of the changes to the Uptown neighborhood since taking over the store from his sister in 1986. 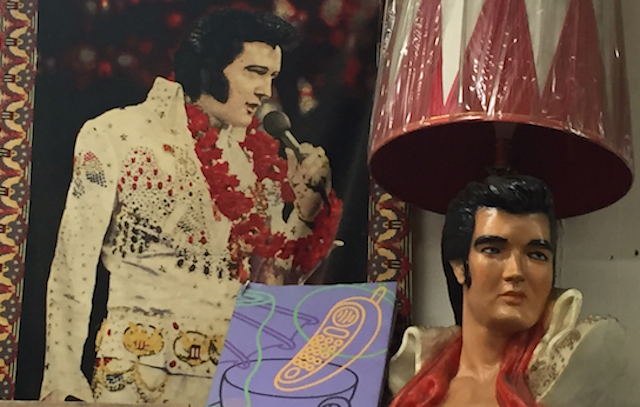 He began in the record store business, when the wax platter was the music delivery system of choice. 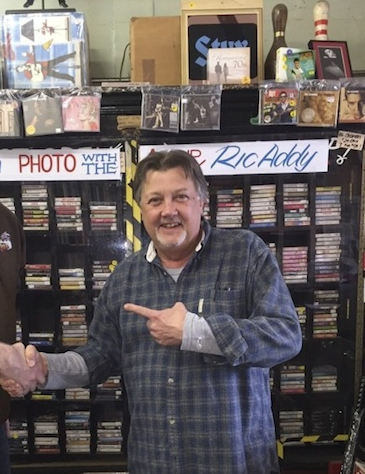 After gaining experience from Rose Records downtown, and the Record Exchange in Evanston (Illinois, north of Chicago), he decided to take over the “Book Box” location his sister had run since 1966. For the last 30 years, through an ever-changing dynamic of Uptown viability, Ric Addy has ruled his little record and book nook in the shadow of the historic Uptown Theatre. HollywoodChicago.com: You are inside a historic block in the neighborhood of Uptown. What legacy do you believe you’ve given to this location, in the history and mystery of the Green Mill/Uptown Theatre/Last Days of ‘Nelson Bros. Furniture’ block? Ric Addy: I definitely made a difference here. I opened the store in January of 1986, and this neighborhood was very rough. The magic was that Dave Jemilo comes in, and buys the Green Mill Cocktail Lounge [historic bar and Jazz club] three months later. Boom! Together, him and I cleaned up the block. He rehabbed the Green Mill, and I ran my shop. There was a notorious liquor store next to me at first, selling cans of beer illegally and single cigarettes. They would serve people who literally crawled through their door – I fought with them constantly. One day I just had enough, because the place wasn’t helping me. I went to our landlords – who owes the whole half block – and gave them a they-go-or-I-go ultimatum, so they didn’t renew the liquor store’s lease. A few years later, when ‘Crew’ [bar] and ‘Caravan’ [restaurant] came in, a new entertainment district was born. HollywoodChicago.com: When you took it over from your sister, the store was called the ‘Book Box.’ How did you come up with the unique ‘Shake, Rattle & Read’? Addy: Well, it’s a play on the old Big Joe Turner [or Bill Haley] song ‘Shake, Rattle & Roll’ obviously, and it was born from a brain storming session with John Cusack, around the time he had done the ‘High Fidelity’ movie here. HollywoodChicago.com: When the area is darkest and quietest, especially during your early days, which ghosts spoke to you the most? Addy: Probably all the type of people that once heavily occupied Uptown, the Appalachians, or hillbillies, and Native Americans. I use the term hillbilly endearingly, because my brother-in-law James is one. James and his family came from Raven, Virginia, to work in Chicago, and the concentration of those folks were in Uptown. The American Indians also had a presence. When Dwight Yoakim first came to town, before he was big, he shot his first music video in Uptown at the Aragon Ballroom, when he opened for the Violent Femmes. Dwight wasn’t well known, but was a rockabilly cat, so he was accepted in the punk circles. HollywoodChicago.com: Those are some pretty good ghosts. HollywoodChicago.com: There have been hundreds of stories regarding the tunnels under the building…what is your favorite personal story, either that happened to you or part of the history, that you’ve encountered in regard to the tunnels? Addy: People love the history of Chicago, period. The tunnels themselves are not that unique, because they ran throughout the entire city. If you remember the Chicago Loop ‘flood,’ in the 1990s, that happened because the tunnels underneath the city cracked, and the Chicago River filled them up. They were intended to make coal delivers to the Uptown Theatre, the Aragon Ballroom and the Uptown Bank. They’re all pretty much blocked up, in fact it’s now like a glorified basement, but you can see where they led to. I was over at the Aragon Ballroom once, and they showed me where it was bricked up, but at one time you could get from the Aragon basement to my basement. That was the tunnel. HollywoodChicago.com: How about the gangsters using the tunnels under the Green Mill? Addy: Once we found a coffin shaped box that had a bunch of old bank deeds in it. Wendy and Lisa from Prince’s band came over from where they were appearing at the Aragon, and went through it, hoping to find an Al Capone signature. There is still a large bathroom downstairs, which for sure was used by Capone. During prohibition, they had illegal card games down there, and stored the booze. If there was a raid at the Green Mill, Al could escape behind the bar and go to my basement, and then get to the street. HollywoodChicago.com: As a record expert, did you ever think vinyl would make a comeback as profoundly as it has, and what do you attribute it to beyond people virtually having it all on the internet? Addy: It’s about the sound – record albums just sound warmer. We’re all overwhelmed with computer entertainment, so there is something just relaxing about buying a turntable, physically putting a record on it, and turning it over again 15 minutes later. It’s become a great social thing with kids, I’m observing, they get together and play their favorites. It’s playful, unlike a CD or digital download. HollywoodChicago.com: Every collector has his holy grail. What is your holy grail and why? Addy: My favorite record of all time is The Rolling Stones ‘Exile on Main Street,’ so I have a first pressing of that, and it came with 12 fold out postcards. I really just enjoy the records themselves, but I’ve had a few valuable ones, like the DJ promotional pressing of Bruce Springsteen’s ‘Born to Run.’ I sold it on ebay for over a couple thousand dollars. HollywoodChicago.com: Shake Rattle and Read is a browser’s paradise, encountering a rare book or recording is part of the treasure hunt. What is an example of a customer who was nearly emotional as to what they found here? Addy: Just last week, there was a guy who I hadn’t seen for awhile come in to say goodbye, and was looking in the bins, and found a record that he’d been looking for in the last ten years. He just happened to find it that day, and he was nearly in tears, because he looked everywhere to no avail. And there it was in the bin. HollywoodChicago.com: As we sit here, it is three weeks to close. Are you mentally avoiding the date, or are you looking forward to it getting here, and why? Addy: I’m mentally avoiding it. [laughs] I’ve never closed a store before, and I didn’t really want to close it, I wanted to sell it as is, just like I took over from my sister, and move on. The landlord, who had been great to me, told me it was time for him to rehab the place. I understood his point of view. HollywoodChicago.com: And finally, as one door closes – a legendary door that people who live in this neighborhood will remember for a long time – another door opens. What do you anticipate on the other side of that new door, and how do you want to create your next legacy? Addy: I’m going to head down to St. Petersburg, Florida, because it’s a good time for me to escape the winters in Chicago, and I need new stimuli. I’m turning 65, and it’s time for some new adventures…I’ll go hang out with the pelicans. 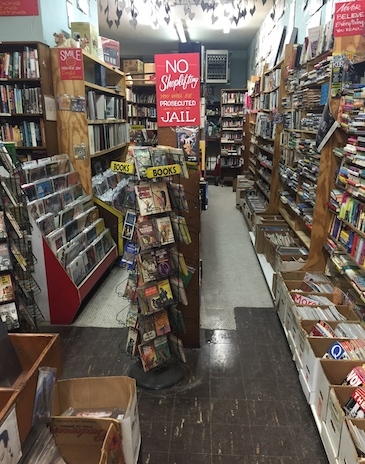 “Shake, Rattle & Read” will close forever May 21st, 2016, and all used items will cost one dollar, with new items at half price, and is located at 4812 North Broadway Street in Uptown Chicago. The Green Mill Cocktail Lounge – 4802 North Broadway – will host the “Ric Addy Retirement Party” from 1-4pm on May 22nd, 2016, where Ric Addy the musician will also perform. Click here for details.